Annual educational challenge saw abundance of creativity. 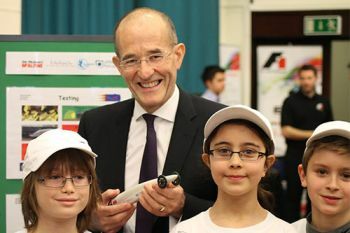 Close to 200 school children gathered at City University London on 5 February for the London and South East England Regional Final of F1 in Schools - an annual educational challenge in which more than 20 million young people across the world aged nine to nineteen, work in teams to design, build, test and race miniature Formula One cars. Participating teams ran cars made of balsa wood along a 20 metre track at speeds approaching 40 miles per hour. They also presented their branding, sponsorship and marketing ideas to a panel of judges. 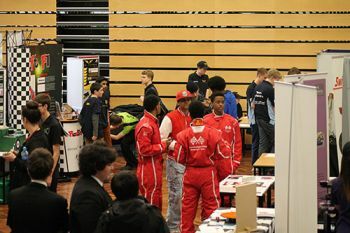 City has supported F1 in Schools for several years, offering scholarships to study undergraduate courses in its School of Engineering and Mathematical Sciences to the winning World Champions. "We are very pleased to be continuing our relationship with F1 in Schools and we strongly support its objective to help change perceptions of science, technology, engineering and mathematics". Four winning teams from the event, 'Team Tempest' from St. John Payne School, Chelmsford; 'Team Redshift F1' of Wilmington Grammar School for Boys, Dartford; 'Team Sixth Gear' from Invicta Grammar School, Maidstone; and 'Team Turbocharged' of Winchester College, will proceed to the UK National Final at The Big Bang science and engineering fair at London's ExCel Centre next month. There, they will vie for a place to represent the UK at the F1 in Schools World Championships in Austin, Texas, later in the year. 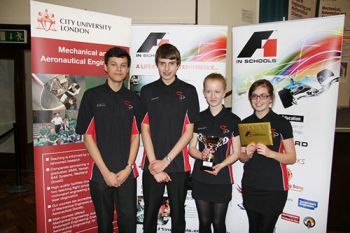 Commenting on the successful event, Roger Valsler, Team Principle of student racing team, City Racing and City's F1 in Schools Coordinator, said: "I am pleased with the way everything unfolded on the day for the 35 teams taking part in the London and South East England Regional Final". Prizes were presented by Professor Chris Atkin, Interim Dean of the School of Engineering and Mathematical Sciences (SEMS), Professor Sanowar Khan, Deputy Dean of SEMS, and Richard Basch, Chief Operating Officer of the School of Engineering and Mathematical Sciences and the School of Informatics.To listen to BBC Radio London's coverage of the event, please use the audio link below.